All kaiju fans are hereby ordered to see this 26-minute homage to Japanese giant monster movies. It might be the first film of its kind rendered entirely in CGI, but don't let that fool you. It looks and acts like the best of the Toho Godzilla films. See this film!!!! Make it a part of your life. This film pays homage to a wide variety of 1950's and 60's Japanese monster movies such as Godzilla, Mothra, and other classics which first brought global attention to Japan's then-emerging post-war feature film industry. The beauty of Negadon: the Monster from Mars is that Jun Awazu "gets it". He understands the gist of what makes a great monster movie. He captures the spirit and flavor in a way that few people can. Now that Evangelion has enjoyed an unbroken run on Cartoon Network, you probably think you've seen it all. Grit your teeth, settle down and throw away the last two episodes of the TV series. Here's the movie that essentially re-does the ending, changing things so that they make a bit more sense (depending upon your outlook), as director Hideaki Anno recreates the epic of epics and settles, once and for all, the greatest anime series of all time. This unrated feature, suitable for ages 17 and older, contains considerable violence, profanity, grotesque imagery, and sexual situations. So, hide the kids from this, it's a much more an adult epic than the TV series was, appealing to a mature generation of fans who grew up watching it. This may be the most exciting product we've seen in quite some time. If you ever wished that Photoshop did more, and combined the power of Quark Xpress and Adobe Illustrator in one complete package, this is the software you have been wishing for. 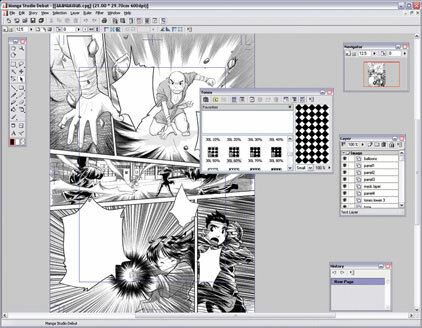 Manga Studio, created by a leading software manufacturer specializing in 3-D tools, allows you to create your own comics and manga right on your PC or Macintosh. The "Professional Version" is actually used by many Japanese artists to produce Manga in the fast-paced industry that keeps everyone in a constant state of caffeine buzz. One of the fundamental core concepts of anime is advanced technology and how it will affect the human race. Since the beginning of the anime revolution in Japan, series like Astro Boy and Gigantor have explored such topics as the importance of robots and androids in the world of the future and what it means to be human. Movies like Akira have touched upon the power of the atom, the advances and tragedies nuclear power will bring to the Earth. Equally important, stories like Ghost in the Shell explore the limits of human/machine interface and ask if there are any limits to the possibility of computer intelligence. More than any other entertainment field, anime deals with the future of science and technology and explores topics rarely dealt with elsewhere in fiction or film. If you're an absolute beginner, or you're looking to start teaching Japanese to someone young, this is an excellent way to get started. This is a children's book with fun-filled illustrated panoramas focusing on scenes familiar to children aged three through eight, such as home life, the classroom, city life, sports, the zoo, and even outer space! Hundreds of words each have their own illustrations and most pages have large, beautiful composite drawings great for point and name practice.